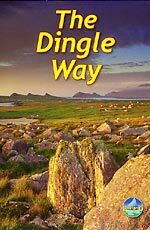 The latest edition of the Dingle Way was updated in 2016. It is one in a series of books documenting long-distance international walking trails by Scottish publishing house Rucksack Readers. 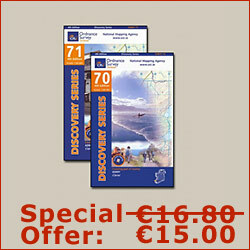 Beautifully presented in a spiral-bound format, this book comprehensively covers all aspects of the Dingle Way in 64 full-colour pages. A fantastic selection of high-quality photographs are found throughout the whole book. A fold-out map at the back of the book breaks down the entire route over four pages and highlights points of interest which are adjacent to the trail. The cover and inside pages are all waterproof which particularly suits the unpredictable nature of Kerry weather. The Dingle Way book is divided into three main sections. The first deals with preparation for the trip. This includes notes on different travel options, tips for novice walkers and understanding safety in the mountains. The second section is an overview of the Dingle Peninsula and gives a good appreciation of the geology, history and wildlife in the area. An additional walk to the Blasket Islands comes recommended and is accompanied with relevant notes. The final section is made up of point-to-point instructions to aid in the navigation of the trail.